Pettiskirts for little girls are definitely a strong trend in the kids fashion market - those dreamy, luxurious, floating, twirly skirts that give a nod to tutus in colours you could eat. And I'd like to welcome fabulous flounce designer Flounce About to the Bondville sponsor stable. 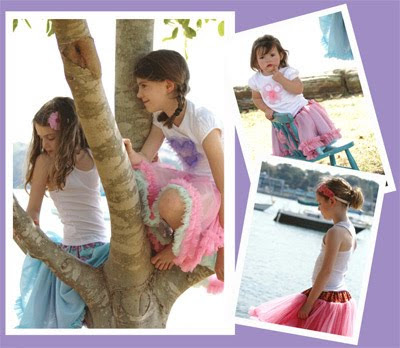 Luckily we have access to Australian-made pettiskirts - Flounce About skirts are handmade with love in Sydney. 1. Princess Flounces - traditional pettiskirts with the fullest flounce. 2. Party Flounces - incorporating cotton fabric at the top of the skirts while still having lots of twirl factor. Can be made reversible in two colours. 3. Playdate Flounces - combinations of patterned cotton fabrics with a flounce around the bottom; perfect for the park or more special occasions. 4. Flowergirl Flounces - made-to-order extra special flounces for the Flowergirl to match your Bridal Party. Flounce About also make pretty matching t-shirts, tank tops and onesies. 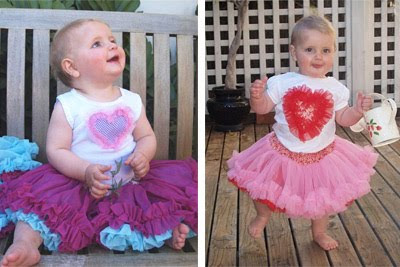 You can find Flounce About pettiskirts in the online store, as well as at markets around Sydney. And forget Tupperware/lingerie parties - if you live in Sydney, you can get together with a group of friends to have a Flounce About party! Make sure you keep up-to-date on all Flounce About happenings on the Flounce About blog. That is the most darling name for a company I have heard in quite some time. My goodness, do they make flouncy skirts for us mamas living in a household of boys?